The start of the first Four Bridges dragonboat race in 2014. HISTORY will be made on the River Derwent at New Norfolk this Saturday when about 200 paddlers in 10 dragon boats assemble for a marathon race to Hobart. 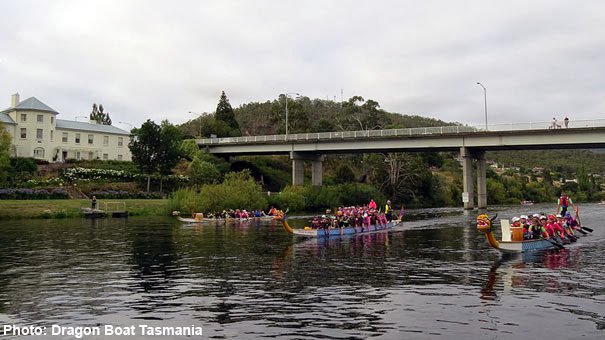 The "Four Bridges" event will challenge nine interstate and one local crew to paddle 40km downstream, passing under bridges at New Norfolk, Bridgewater, Risdon and Hobart. The Derwent Valley Council is the major sponsor of the event and has welcomed the opportunity for the New Norfolk to play a major role. The New Norfolk Rowing Club will be a hive of activity from 7am with a mass launching of dragon boats and support vessels. 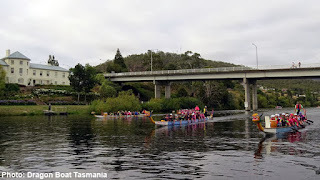 Organised by the Lindisfarne-based Derwent Storms Dragon Boat Club and Dragon Boat Tasmania, Four Bridges is rapidly becoming a must-do event on the national sporting calendar. Event director Andrew Lovibond said dragon boaters around the country were always on the lookout for opportunities to travel and paddle. "National regattas, including championship and Pan Pacific events, attract a huge number of dragon boaters but events like Four Bridges and the marathon paddle on the Ord River in the Northern Territory offer a different kind of challenge," Andrew said. "Four Bridges was fully subscribed by word of mouth. There was no need to advertise it. In fact we have had to turn down interstate crews simply because there are insufficient dragon boats in Tasmania to accommodate them." The inaugural Four Bridges held two years ago was contested by five boats. Andrew said clubs around the state had provided boats this year, opening the event to 10 crews. "We are really looking forward to hosting such a big event and are most grateful to the Derwent Valley Council and the New Norfolk Rowing Club for their tremendous support," Andrew said. "If the locals are up bright and early they are most welcome to come down to the river and watch the start." The paddlers will have a couple of rest stops before passing under the Bridgewater Bridge and will break for morning tea at Austins Ferry. The toughest part of the paddle will be the final leg to the Bowen and Tasman bridges. "With an early start we hope the fleet will arrive in Hobart before the sea breeze kicks in," Andrew said. "It will be a long haul into Lindisfarne Bay against a stiff sea breeze. The paddlers will really be looking forward to a rousing reception at the finish." Interstate supporters will watch the event from the former vice-regal launch, Egeria. Now based at the Motor Yacht Club of Tasmania, the Egeria will meet the fleet at Bridgewater and follow the dragon boats to the Tasman Bridge. "It's important that we cater fully for our interstate participants," Andrew said. "We want to make a marathon paddle in Tasmania a biennial event and the focus is on making it as enjoyable as possible for all involved.